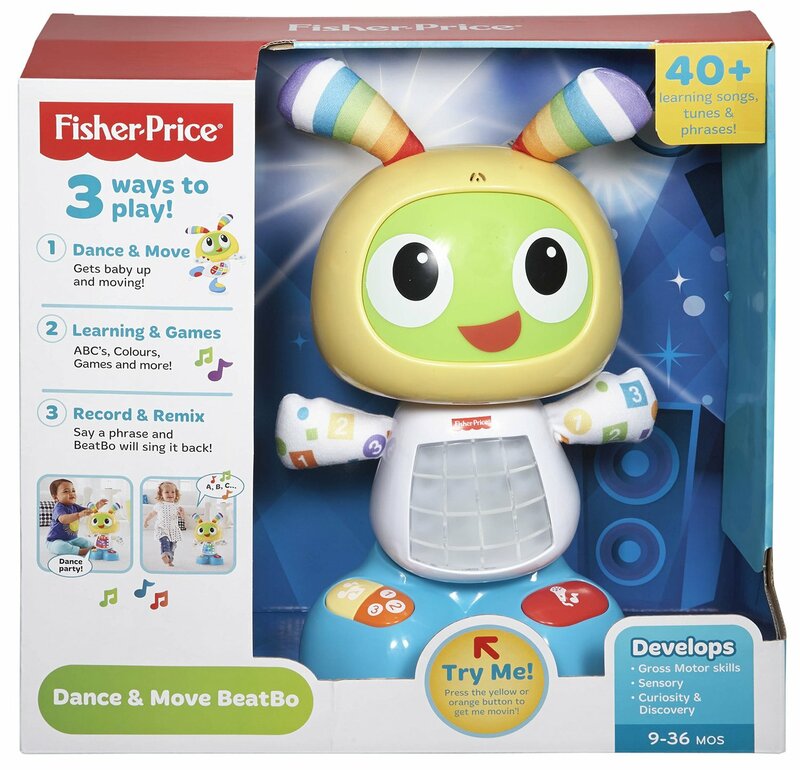 Today we are excited to be giving away a Fisher Price Dance and Move Beat Bo which has fast become one of the most wanted baby and toddler toys! I remember trying to get one for Harry for Christmas but everywhere was sold out however I was finally able to get one earlier this month for his first birthday and I'm so pleased I did because he loves it!! 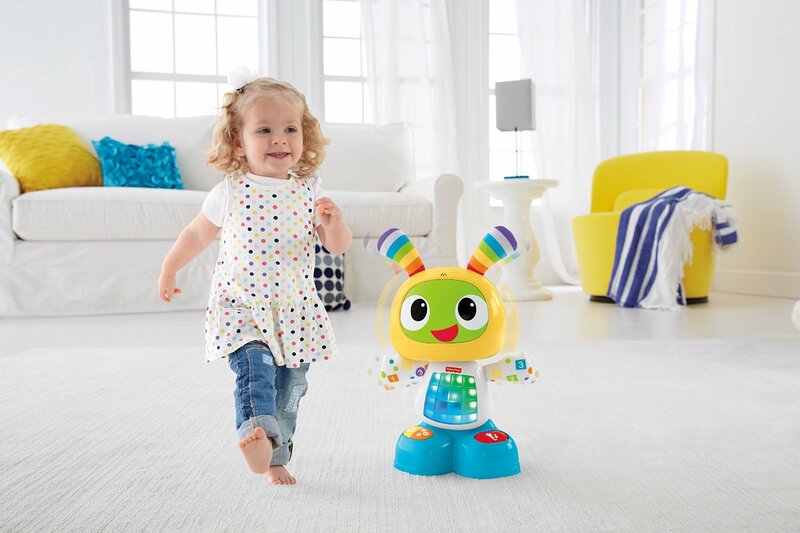 The BeatBo is aimed at ages 9-36 months however Amelia is nearly four and loves playing with it too and understands the activities and likes making it talk for Harry. 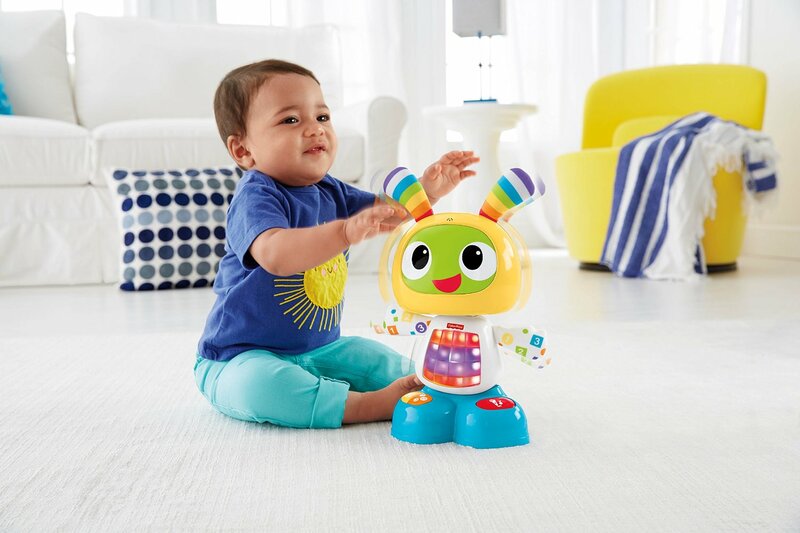 With fun dancing action, light show, personalised sing-along and 40+ learning songs, tunes and phrases, he’s a buddy to get baby moving and grooving. A press of BeatBo’s tummy or any of the buttons on his feet activates fun songs, learning content and dance moves. This futuristic friend even allows mummy or baby to record a phrase and he’ll remix it into his favourite song. His three modes - dance ‘n move, learning and games, and customised sing-along - grow with baby to make him a fun, entertaining companion for years to come. And all the while, he’s introducing baby to letters, colours, counting, music, cause and effect and much more. 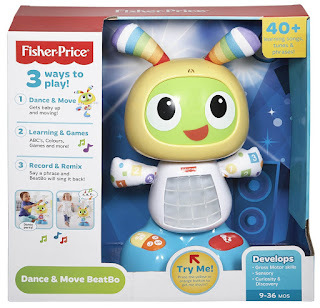 To be in with the chance of winning Fisher Price Dance & Move BeatBo all you need to do is complete the mandatory entries in the Rafflecopter below. Feel free to complete any others for bonus points! 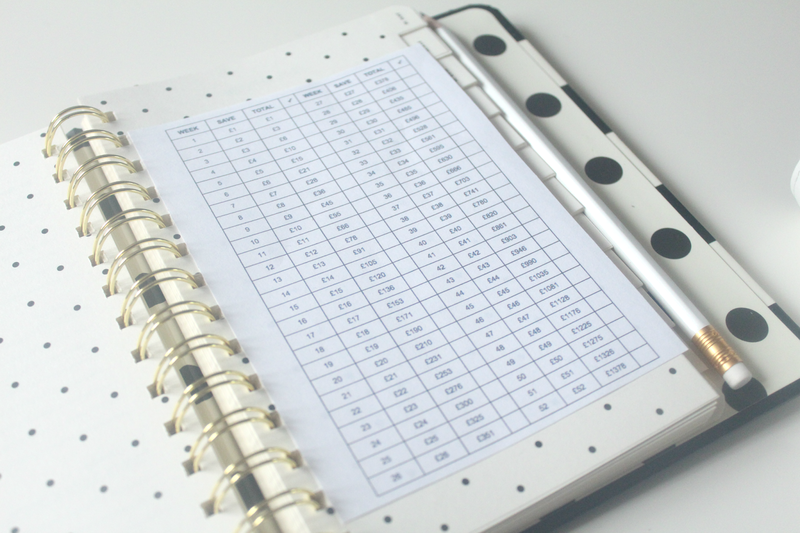 The giveaway will end on February 1st and is open to UK residents only. Good luck! Would love to win for my daughter, she's a very active little girl! My youngest boy would love bopping along with this! Love how clever this toy is. My daughter would really enjoy it - she is 16 months. I'd love it for my friend's little boy,it looks good fun! I would love to win this, because it would bring a big smile to my nieces face. I would love this for my daughter who will be 1 in February! For my friends little boy! I would love to win as I really wanted to get one for my little boy's Christmas but didn't realise how popular they would be and couldn't get a hold of one anywhere. It's his birthday soon and he would love it as he loves music and dancing. Would love to win it because my nephew would love it! Quite simply because my little boy, the apple of my eye, would love it! Looks nice for my friends child. Because Noah would just love him! I'd love to win for my daughter to have but my eldest would be able to enjoy too. To give to Blake I just know he would love it! My niece loves singing and dancing, she would adore it. I'd have hours of fun with my grand daughter! She spends 3 days a week with me. For my lovely little nephew. My little girl would love bopping along to it! Would be great for a friends son who likes to move around. 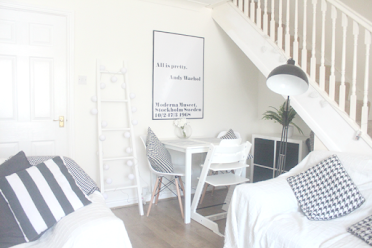 As i've got a very energetic 2 year old who loves to move and i'm about to have another baby! I would love to win this for my Ron Luke. He has been poorly, so would love a treat for him. The beatbo looks like so much fun. My grandson is just finding his feet & i think this would help to get him there. I'd love to win this for my niece! I would love to win this for my baby. He is just starting to enjoy toys that flash and make sounds. As my nephew loves music and loves to dance so what better toy to have in the house! It would keep him having fun and being active! I would love to win this for my daughter who is due in March! ...because I know already that my niece would love it. My step-granddaughter is about to have her first birthday, this would be ideal for her! I'd love to win for my son. He'll be 2 in April, so a perfect present for him! Tried to get hold of one at Christmas with no joy. 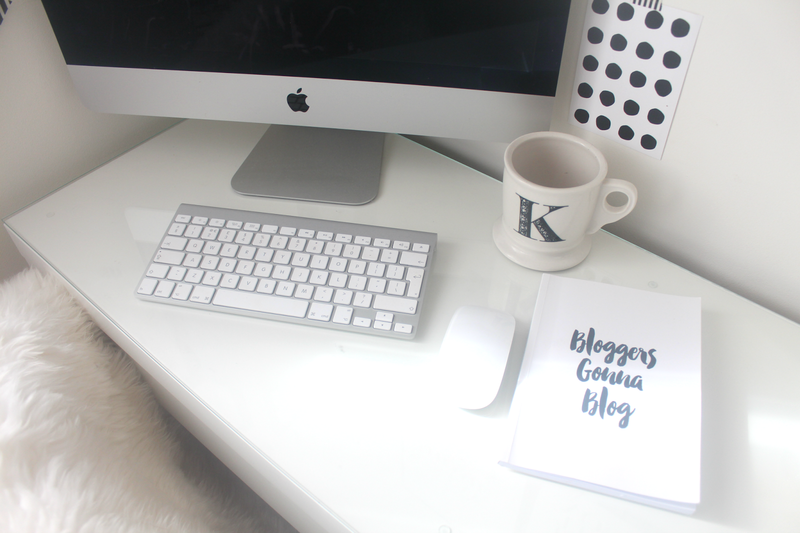 Fingers TIGHTLY crossed! Thank you. I'd love to win for my great nephew, he's started pulling himself up on things now, I'm sure he'll be on his feet any day now. This looks like so much fun for my little boy! I would love to win this for my niece to play with. She's just getting interested in toys and I'm sure she would have a lot of fun with it. This looks so much fun to play with. My daughter likes to dance! Because it looks like so much fun! My Little Boy Would Love It! I'd love it for my baby goddaughter - she'd love it! I also tried to get one of these for my Harry at Christmas! Fingers crossed! My bestie's twins would love this!! My little God daughter would love this. I'd love to win for my little boy Liam. Would love one of these for my nine month old Eliana, she loves to dance so would definitely love it! Would love to win it for my daughter, had my eye on it for Christmas and put it on her list but no one bought it for her. I have became a nannie for the first time 4 weeks ago and at christmas I viewed these to buy as a present for my grand daughter for for her in a few months time.This would be so special to win for both my grand daughter and her me her nannie. i love to win one for my little cousin they would love this! My little nephew Bobby is a groovy little fella and just loves dancing, Dance Move BeatBo would be a lovely little buddy for him to dance along with! new uncle Jamie likes nothing more than visiting his new baby niece Arianna and spoiling her. He just knows she would love this. We have several little people in our family who love music and dance. It's such a joy to see them bopping around the living room. I'd love to win for my daughter!! She would love this!! She's just started enjoying dancing at every song that she hears so I'm sure she's love dancing along with the robot!! my little niece would love this - very colourful and looks like fun! My little niece would love this! Can't beat fisher price toys for value and entertainment! I'd love to win for my little boy because he loves bopping along to music so I think this would be perfect for him! Would love to win for my son. He is just getting into music and waving his arms in the air, when he hears music, he is so funny and makes us all laugh when doing it. Thanks for an amazing competition..would love this prize for my baba girl alaska..she loves dancing..good luck all! My granddaughter Georgia is three and goes to 'wiggle wiggle' club where music and movement are the emphasis. She loves dancing to every genre going. Any day now there will be a new brother or sister, so soon there will be a second child to play, enjoy, dance and learn from such an educational toy. I would love this for my son - he can't keep still! I would love to win this because it looks like such fun, and I'm sure my friend's little girl would love it! I would love to win this for my Nephew Kyran,I think he would have loads of fun playing with it! My 2 year old would love this. She loves dancing and singing. I'd love to win it for my nephew who turns 1 next month! My little boy loves to bop to music so he'd love this.